Park Access Passes will be available for purchase at Thompson Park Headquarters, Lincroft, from 8 a.m.-4 p.m., Monday-Friday (excluding holidays), March 18-June 14. Passes will also be available for purchase at Seven Presidents Oceanfront Park on weekends starting May 11 and daily starting June 15. In 2019, park access passes are needed weekends and holidays, May 25-June 9, and daily, June 15-September 2. Both daily and season passes will be available. Season passes are $70 for adults 18 to 64; and $25 for adults 65 and older. Children under 18 are free. Season parking passes are $70. Download an application for Park Access Passes. Lifeguards are on duty weekends from Saturday, May 25 through Sunday, June 9 and daily from Saturday, June 15 through Monday, September 2. Guarded swimming hours are from 10 a.m.-5 p.m. 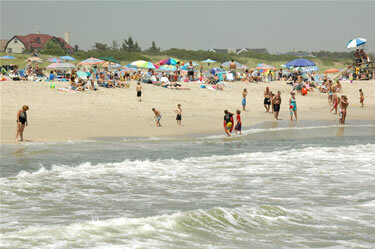 In the summer, this 38-acre beach park is a great place to swim, sun and surf. In the off-season, a nice place for quiet walks. Everything needed to enjoy a day at the beach is readily available during the summer months: snack bar, sheltered eating areas, volleyball area, outdoor showers and changing areas, guarded swimming, designated areas for surfing. The park also offers a reservable picnic tent for groups up to 50. Please be aware that NJ anglers age 16 and up are now required to register with the NJ Saltwater Angler Registry (for free) to fish in marine and fresh tidal waters of NJ. For more information regarding the registration, click here. Also, light-weight cartop vessels such as kayaks or canoes may be launched but, boaters can not drive down to the beach and must carry their vessel from the parking lot to the water. Download application for Boat Launch Pass (PDF). See our rules and regulations. Park admission and parking fees are charged from Memorial Day weekend through Labor Day. During the rest of the year, admission is free. 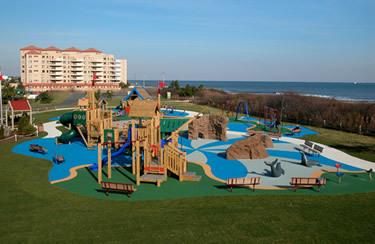 During each season, the Park System offers seashore-oriented programs at the Activity Center. The park is open every day from 7 a.m. to dusk. During the beach season, the parking lot gate opens at 8 a.m. Entrance and parking fees are charged for all visitors, including surfers and fishermen, from 8 a.m.-4 p.m. daily through Labor Day. From April 1 to October 31, pets are not permitted in the park; from November 1 to March 31 pets are permitted throughout the park, including the beach, provided they are on a leash at all times. Pets are prohibited year round from the playground, Skatepark, pavilion and decks, boardwalks, dunes and habitats. No smoking or use of tobacco products on the beaches, pavilion deck, or boardwalk from 8 a.m. to 8 p.m.
Park Access Passes will be available for purchase at Thompson Park Headquarters, Lincroft, from 8 a.m.-4 p.m., Monday-Friday (excluding holidays), March 18-June 14. Season passes are $70 for adults 18 to 64; and $25 for adults 65 and older. Children under 18 are free. Season parking passes are $70. Download application for Park Access Passes. Active duty military members, veterans, their spouses and dependent family members are admitted free (including parking) with appropriate military ID. Accepted ID includes active duty military/national guard ID cards, retired military ID cards, and or a Veteran's ID card. For information on how to obtain a Veteran ID card for Monmouth County residents please click here. The City of Long Branch, since June 2014, is charging for street parking in the vicinity of Seven Presidents Oceanfront Park. Please check signs and use pay stations. From Memorial Day Weekend-Labor Day Weekend, a parking fee will be charged from 8 a.m.-4 p.m. (please see above for closing time) at the Skateplex parking lot. Tony’s Place, named in honor of former Board of Recreation Commissioners Vice-Chairman Dr. Anthony Musella, is a universally accessible playground. It is the second joint venture playground project of the Park System, Challenged Youth Sports (based in Middletown) and Friends of the Parks. "Summer Fun at Tony's Place" is a program that provides free access to the playground during the summer for children with special needs and their accompanying families. There is no fee but a permit is required. Phone 732-842-4000, ext. 1, Monday-Friday, 8 a.m.-4 p.m. Reference program #Q0282A. Host your next family or group outing at the picnic tent, just steps from the beach and Tony's Place playground. Reserve your date for exclusive use of the tent for your group to enjoy. Park admission and parking fees apply during peak season. More details here. The Skateplex is officially reopened and better than ever. During the recent renovation, the Skateplex underwent a massive redesign that replaced nearly all of the existing features with a new concrete street course. Designed to allow skaters to move seamlessly through its features, the course offers floating ramps, ramps, stairs, planters and stainless steel grind rails while incorporating the existing bowl. The Skateplex is open year-round, 8 a.m. to dusk and use is subject to weather/safety conditions. An ANSI or SNELL approved helmet must be worn by those under 17 at all times while in the Skatepark. It is recommended that users age 17 and older also wear a helmet. Elbow and knee pads are recommended for all ages. Bikes and scooters are NOT permitted. See our rules and regulations for the Skateplex. Please note that the in-line skate rink will not reopen as a result of storm damage. There are no plans to rebuild the rink but various options for construction of other skate features are being considered, should funding become available. More than just a clean place for fun in the sun, this park is also a protected ecological habitat. 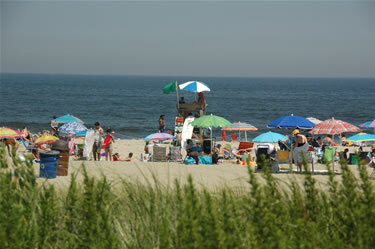 The Park System regularly reinforces the sand dunes by planting erosion-fighting beach grass. These dunes act as a natural barrier against severe storms and serve as a habitat for threatened bird and plant species. As such, certain areas of the beach are sometimes closed and removed from the beach raking schedule to “let natural processes prevail.” This is done so that various native species may survive and thrive undisturbed. Long Branch was placed "on the map" in 1869 when President Grant made the city the nation's "Summer Capital," a tradition followed by Presidents Hayes, Garfield, Arthur, Harrison, McKinley, and Wilson. In the late 1800s Seven Presidents Oceanfront Park was the site of "The Reservation" that Long Branch businessman Nate Salsbury built for his Buffalo Bill Wild West Show. Buffalo Bill Cody, Annie Oakley, and Chief Sitting Bull were among the many performers. Garden State Parkway to exit 105. Follow State Hwy. 36 (Joline Ave.) 6.5 miles to park entrance. State Hwy. 36 southbound, follow to Joline Ave. traffic light. Turn left. Follow to Park entrance.